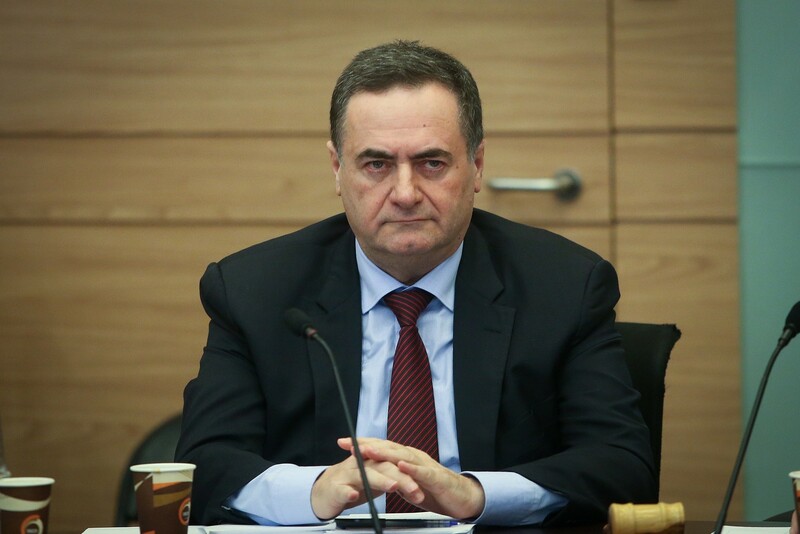 If Iran chooses to continue pursuing a nuclear program it will face a “military” response, Intelligence Minister Israel Katz warned Wednesday. Katz was responding to the Iranian nuclear chief’s statement that the Islamic Republic’s program stands ready to build advanced centrifuges and further enrich uranium. Ali Akbar Salehi told The Associated Press on Tuesday that Iran wouldn’t be deterred by US President Donald Trump’s sanctions and withdrawal from the global nuclear deal. The US withdrawal from the deal in May has already badly shaken Iran’s economy, crashing its currency, the rial. Katz said Iran could either cave to Trump’s demands or watch its economy collapse. Salehi had said he hoped the atomic deal would survive, but warned the program would be in a stronger position than ever if not. In a veiled threat to Israel, Salehi said the consequences would be “harsh” if there were any new attacks targeting Iran’s nuclear scientists. A string of bombings, blamed on Israel, targeted a number of scientists beginning in 2010, at the height of Western concerns over Iran’s program. Israel never claimed responsibility for the attacks on the scientists, though Israeli officials have boasted in the past about the reach of the country’s intelligence services. “I hope that they will not commit a similar mistake again because the consequences would be, I think, harsh,” Salehi warned. Israel earlier this year removed tens of thousands of documents and other materials from Iran’s secret nuclear weapons program archive, stealing them from under the regime’s nose in a Mossad operation in Tehran. The material proved that Iran lied when claiming it was not seeking to build a nuclear weapons arsenal, Prime Minister Benjamin Netanyahu said, and showed that it intends to resume its nuclear weapons program if it can. The 2015 accord, struck under then-president Barack Obama’s administration, saw Iran agree to limit its enrichment of uranium in exchange for the lifting of crippling economic sanctions. Salehi also spoke about Iran’s efforts to build a new facility at Natanz’s uranium enrichment center that will produce more advanced centrifuges. Those devices enrich uranium by rapidly spinning uranium hexafluoride gas. While the UN repeatedly has verified Iran’s compliance with the deal, Trump campaigned on a promise to tear it up. In May, he withdrew the US in part because he said the deal wasn’t permanent and didn’t address Iran’s ballistic missile program and its influence across the wider Middle East. But Trump meanwhile has tweeted he’d accept talks without preconditions with Tehran. Iran has between 3,000 and 4,000 active centrifuges, Parliament Speaker Ali Larijani said Wednesday, according to the Tasnim news agency—still within the limit allowed under its troubled nuclear deal with world powers.The rare announcement of specific data on the nuclear program came days after Iran’s nuclear chief said it had completed a facility to build advanced centrifuges—Tehran has said it will increase its capacity to enrich uranium if the nuclear pact collapses following Washington’s withdrawal in May. The deal allows the Islamic Republic to operate up to 5,060 first-generation centrifuges for 10 years at its Natanz plant and 1,044 first-generation centrifuges at its underground Fordow enrichment plant.Before the deal, Iran had 20,000 centrifuges installed at Natanz and Fordow, according to the International Atomic Energy Agency (IAEA). The remaining signatories to the deal—Russia, China, Germany France and Britain—are trying to salvage the accord. 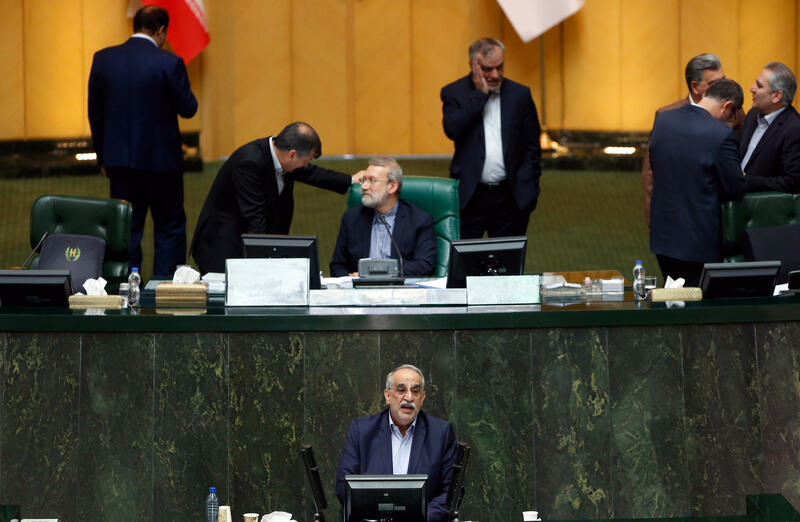 “America and Israel have a program against Iran and they scrapped a deal they requested,” Larijani said, according to Tasnim. Iran’s nuclear chief Ali Akbar Salehi told the Associated Press on Tuesday that he hopes the atomic deal between Tehran and world powers survives, but warns the program will be in a stronger position than ever if not. As the world marks 17 years since the 9/11 attacks in the United States, the time has come for western governments to take part in “the strong and clear effort of the Trump administration against the terrorist regime in Tehran,” Prime Minister Benjamin Netanyahu said on Wednesday. Netanyahu again noted the irony that on the same week in June that an Iranian terror cell tried to carry out an attack against an Iranian opposition group in Paris – an attack that Israeli intelligence helped to thwart – European leaders were trying to “appease” Iran and looking for ways to soften the fallout from the US withdrawal from the Iranian nuclear deal. Al-Qaeda, the terrorist group that carried out the September 11, 2001 attacks, has “passed the torch” of extremist Sunni terrorism on to Islamic State, while the extremist Shia variety of terror is being led by Iran, the premier said. “They both have the same goals: to destroy the free societies as we know them, to destroy Israel, and also to destroy the west and others. The time has come for the world to unite in a struggle against the terrorist organizations. It did so to a certain degree in the attack against Islamic State, but has not done it against Iran – the opposite is the case,” he said. Netanyahu also used the start of the cabinet meeting to praise the Trump Administration for its decision on Monday to close the PLO offices in Washington. Federal Aviation Administration cites concerns over military activity associated with the Syrian conflict, including an unnamed U.S. civil operator being intercepted by fighter jets last year • Flight Service Bureau: There is no perfect route in the region. Flight Service Bureau, which provides safety information on airspace to airlines, said “without seeming alarmist,” that the deteriorating relationship between the U.S. and Iran must be taken into account when planning flights in Iran’s airspace. “Although the reopening of Iraqi airspace in November last year has provided additional routing options … there is no perfect route in the region, and operators must consider their preference for Iraq vs. Iran,” the U.S. based group said in an email to clients on Monday. The U.S. State Department advises that its citizens do not travel to Iran due to the risk of arbitrary arrest and detention. Flight Service Bureau said that could present problems in the event of an unplanned landing in Iran for medical or technical reasons. For Iraq, the U.S. State Department advises its citizens against travel to the country due to terrorism and armed conflict. The FAA’s latest guidance on Iraq, issued in December 2017, prohibits U.S. airlines in most cases from flying at an altitude lower than 26,000 feet due to the potential for fighting. U.S. Education Department decides to adopt international definition of anti-Semitism • Decision praised by Zionist Organization of America • Definition recognizes that Jew-hatred can be camouflaged as anti-Israelism or anti-Zionism, says ZOA. The U.S. Education Department’s Office of Civil Rights has decided to adopt the international definition of anti-Semitism, which defines Judaism not only as a religion but also an ethnicity and includes holding Jews responsible for Israel’s actions as a form of anti-Semitism, Israel Hayom learned Wednesday. According to a letter written by Assistant Education Secretary for Civil Rights Kenneth L. Marcus to the Zionist Organization of America, anyone who acts “to deny the right of the Jewish people to self-determination, on the grounds that the State of Israel’s existence is a racist endeavor” or applies double standards to Israel that it does not apply to any other democratic country will be deemed an anti-Semite. Pro-Palestinian activists in the United States have warned the move will hinder pro-Palestinian efforts as any such activity will be deemed anti-Semitic. In 2011, the ZOA filed a complaint against Rutgers alleging that at an anti-Israel event that organizers had said would be free and open to the public, the Belief Awareness Knowledge and Action group discriminated against Jewish and pro-Israel students by charging them admission. While the OCR looked into the matter, it ultimately closed the investigation, citing insufficient evidence of anti-Semitism. At the time, the U.S. definition of anti-Semitism referred to Judaism as a religion only. The ZOA appealed the decision. In a letter to the ZOA, Marcus said he was vacating the 2014 decision by the Obama administration and re-examining the case as possible discrimination against an ethnic group. “The visual perception of the presence of ‘150 Zionists’ referenced in the email could have been rooted in a perception of Jewish ancestry or ethnic characteristics common to the group,” Marcus wrote. The ZOA issued a statement saying, “It took a leader like Kenneth Marcus to finally decide the ZOA’s appeal and to also make it clear that OCR will finally be using a definition of anti-Semitism that makes sense and that reflects how anti-Semitism is so frequently expressed today, particularly on our college campuses. The move is the latest in a series of pro-Israel steps taken by the Trump administration. It follows the U.S. decision to recognize Jerusalem as Israel’s capital and move the U.S. Embassy to the city; cut funding to UNRWA, the U.N. aid agency for Palestinian refugees; and close the PLO mission in Washington. Iran has paid a heavy price for its military intervention in Syria since 2014. The Revolutionary Guards and Quds Force, along with Lebanon’s Hezbollah and Shiite militias from Iraq, Afghanistan, and Pakistan have suffered thousands of casualties. Iran has invested billions of dollars in propping up the regime of Syrian President Bashar Assad and the war Assad is waging against his enemies. That had ramifications back in Iran: In recent months, thousands have been marching in anti-regime protests sparked by economic distress, calling for “Death to Syria” and “Death to Palestine.” The protesters are calling on the Iranian government to stop funding Assad and Hamas and to spend the money on the welfare of the Iranian people. This means bringing the country’s forces home. Now Iran will have to pay. The Assad regime is stabilized and the governments that have fingers in the Syrian pie are examining their options. Given that, Iran wants to be the main foreign power broker, for a number of reasons: Syria has been the Iranian regime’s only ally since it came to power; Syria is an important base from which Iran can expand its influence in Iraq and Lebanon – both of which have dominant Shiite populations. No less importantly, Iran sees Syria and Lebanon as its front line against Israel. To solidify its standing, Iran is seeking to strengthen its security ties with Syria. The most important component of that is to install military forces there for the long term to ensure the stability of the Assad regime, maintain its influence, and up the threat it presents to Israel. At the same time, Iran is working toward closer economic ties with Syria – to recoup some of the massive costs incurred by its military intervention there, among other reasons. Aside from that, Iran is also forming ties with various actors in Syria, such as building Shiite militias for the eventuality that the Assad regime collapses. But these efforts are turning out to be failures. Since 2015, Russia has also been a player and has been providing Assad with important military aid. Syria placed an air force base and a naval base at Russia’s disposal for dozens of years. Russia gradually usurped Iran’s place as the leading influencer that will determine Syria’s future and took advantage of its status to expand its own economic and military ties, over Iran’s objection and at the expense of Iran’s ties to the Assad regime. Even Iran’s plan to keep its forces in Syria for the long term has encountered difficulties. Israel, with U.S. support, is consistently attacking Iranian-Shiite military targets where Iranian forces are exposed, and Iran has no viable response. Russia might have made it clear that it cannot remove the Iranian military presence from Syria, but it is willing to take action to ensure that the Iranians stay at least 85 kilometers (53 miles) from the Israeli border. Despite cooperating with Iran in the Syrian war, Russia is not helping it when it comes to the Israeli strikes and is giving the Israeli Air Force considerable latitude. Iran’s troubles will get worse when an end to the Syrian war is declared, which could include a demand that all foreign forces in Syria withdraw, including the Iranian military and Shiite militias. The U.S., and apparently Turkey, will support that demand. Russia might, too, because it understands that if Iranian forces remain on the ground, it will lead to perpetual clashes between Iran and Israel that will destabilize the situation in Syria. In that case, not even a defense deal will be able to help Syria. Dr. Ephraim Kam is a senior research fellow with the Institute for National Security Studies. Putin and Rouhani are keen to get started on building the new economic mechanisms. A full-scale war in Idlib would disrupt the process, especially if the Turkish president, who is against this offensive, gets in the way. Turkey continues to pour troops into Idlib for widening its foothold there. Neither the Russian nor the Iranian leader – least of all, Syria’s Bashar Assad – want to see their forces confronted by Turkish troops. At their conference in Tehran, the three leaders forged an economic-strategic pact to create measures for fighting American sanctions. 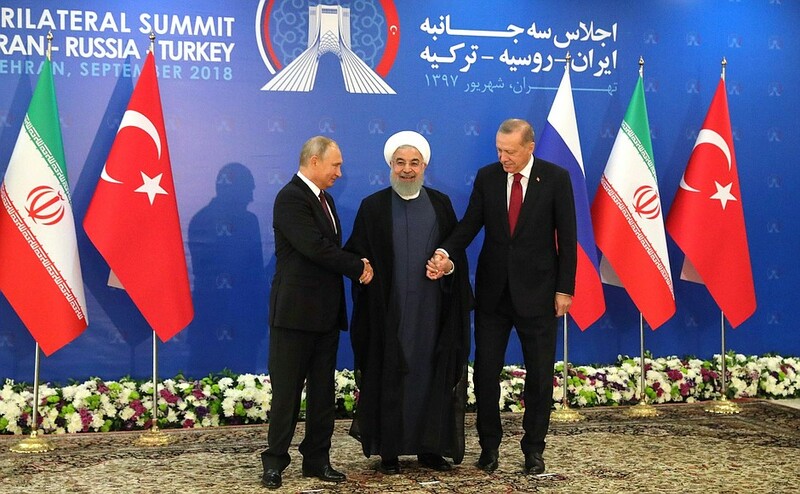 One measure approved was to contract all business deals among Russia, Iran and Turkey, including gas and oil, in local currencies instead of American dollars. The same rule would apply to banking transactions. Russian Foreign Minister Sergei Lavrov first raised this proposal when he remarked that Russia and Turkey could conduct their bilateral trading deals to their national currencies instead of the US dollar. US and Israel paid special note to the trilateral decision reached in Tehran to convert the massive projects for Syria’s post-war recovery (after Iran had solidified its military foothold there) into a back-door hatch for escaping US sanctions against Iran. During the Obama presidency, Oman and Abu Dhabi served this purpose; under Donald Trump, it will pass to Damascus, with the added benefit of protection from the deepening Russian-Iranian-Syrian military cooperation.